PALM BEACH (March 28, 2014) — IT! EVENTS + MEDIA is excited present the first food truck extravaganza ever to be held in downtown West Palm Beach. 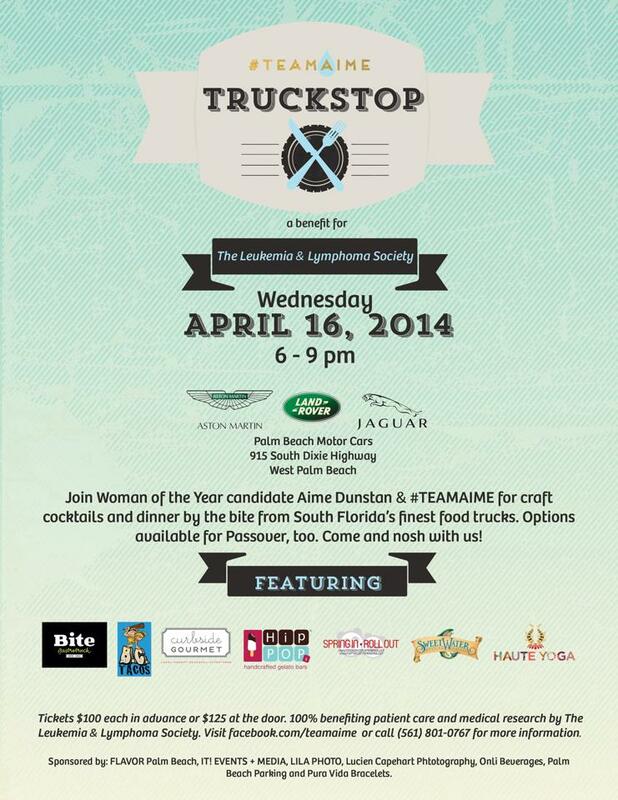 TruckStop: a benefit for The Leukemia & Lymphoma Society (LLS) will ignite the night on Wednesday, April 16 from 6 p.m. to 9 p.m. at the private lot of Palm Beach Motor Cars. For $100, guests will be treated to a sparkling atmosphere of festive libations, entertainment and a non-stop variety of gourmet bites from South Florida’s favorite food trucks. 100% of ticket sales benefit LLS. An unforgettable night of goodwill, TruckStop will feature a chill, al fresco ambience and offer something for everyone. An array of artisan food trucks (interspersed amongst the Jaguars and Aston Martins), including Bite Gastrotruck and HipPOPS from Miami, BC Tacos from Fort Lauderdale, and Palm Beach favorites Spring In, Roll Out and Curbside Gourmet, will dish out their signature fare. There will be sweet and savory items, as well options available for Passover. Craft cocktails, fresh pressed juices and onli sparkling beverages will support the evening’s bohemian chic vibe. In a personal twist, TruckStop is being produced as part of the LLS’s Palm Beach County “Man & Woman of the Year” fundraising campaign to support IT! EVENTS + MEDIA President and Creative Director Aime Dunstan in her nomination. As a survivor of Hodgkin’s Lymphoma, Dunstan feels a personal connection to the fundraising effort. She is the only 2014 candidate to have been diagnosed with the disease and undergone treatment. In addition to those F&B vendors listed above, local companies Palm Beach Parking and Palm Beach Motor Cars are donating resources to support Dunstan in her LLS campaign. More than one million people in the United States are living with or are in remission from a blood cancer. Someone new is diagnosed with a blood cancer every four minutes. New cases of leukemia, lymphoma and myeloma will account for nine percent of the 1.5 million new cancer diagnoses in the United States this year. LLS relies on the generosity of individuals, corporations and foundations. Proceeds from the 2014 Man & Woman of the Year support their mission to cure leukemia, lymphoma, Hodgkin’s disease and myeloma, and improve the quality of life of patients and their families. For more information and to purchase tickets to TruckStop: a benefit for The Leukemia & Lymphoma Society, please visit http://www.mwoy.org/pages/pb/pbc14/adunstan or call(561) 801-0767. Palm Beach Motor Cars is located at 915 S Dixie Hwy, West Palm Beach, FL 33401. For more information on the Palm Beach Area Man & Woman of the Year, please contact Nancy Klein at nancy.klein@lls.org or (561)616-8682. Thanks so much for your support! It’s going to be a delicious night! !